800-1,000 acres will be burnt in Wood Co. March 19-21. It's a training activity for multiple fire departments and it's done to help repopulate the wildlife turkey population in the area. 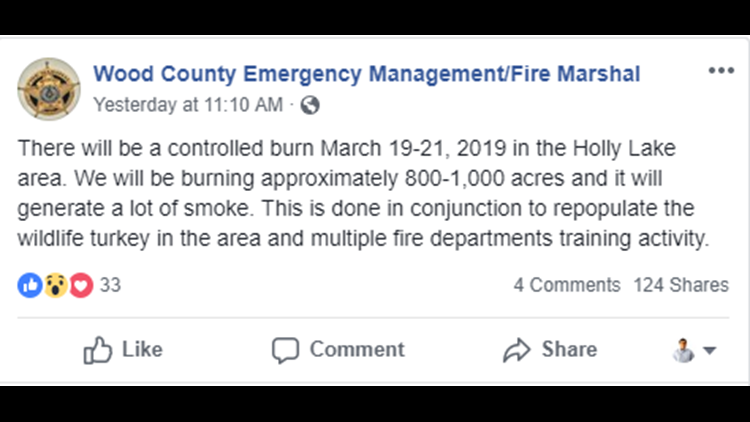 WOOD COUNTY, Texas — The office of Emergency Management and the Fire Marshal's office of Wood County have announced they are burning between 800 and 1,000 acres of land near Holly Lake. It started Tuesday, March 19 and will continue through Thursday, March 21. According to a Facebook post, this is a training activity for multiple fire departments and it's done to help repopulate the wildlife turkey population in the area.